This list was triggered by a very interesting thread on a discussion forum I participate in, on Computer Audiophile. The thread is called “My Essential Classical Albums” by a forum participant called Sphinxsix. The entire thread is very much worth checking out, I found a lot of recommendations on there already. But with this specific question regarding Chopin, I noticed that I already pretty much had all the recordings I recommended covered on my blog. So in part, this is also a “best of list” of my Chopin blog posts. But there are also quite a number of albums I haven’t featured yet. For those albums previously covered, you will find links in the entries below to the original blog posts. In the original blog posts, you’ll also find their respective download links. To me, the Nocturnes are the quintessential Chopin, even more than the Preludes or the Etudes. And when we talk Nocturnes, the legendary Ivan Moravec version really is unbeatable. It is not by coincidence that I’ve ranked Moravec in my in My Top 10 Favorite Classical Pianists for this album alone. I’ve also mentioned this Album in My 25 Essential Classical Music album, as it is so important to me. Right after the Nocturnes, the Preludes are my favorite Chopin, both op. 10 and 25 are oustanding achievements. 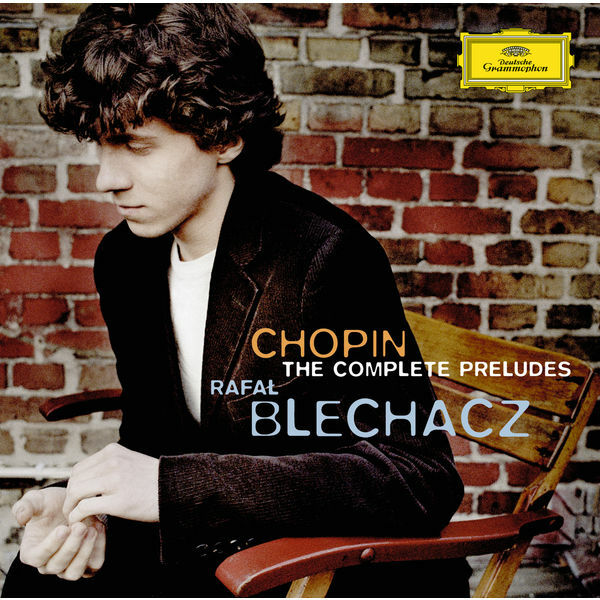 Here again I could have listed dozens of recordings, but for a Top10 list I’d really like to restrict myself to the young Polish pianists Rafal Blechacz, who recorded this as one of his first albums on Deutsche Grammophon after winning the Warsaw Chopin competition. Another “triple winner”, as he also shows up in My Top 10 Classical Pianists and My 25 Essential Classical Music albums with this recording. Some readers may be suprised that I rank these so high, but these little gems are very close to my heart. Completely different, each one of them is a world on its own. Here, my favorite version comes from the young British pianist Benjamin Grosvenor. Grosvenor is also a part of my Top 10 Favorite Classical pianists. The legendary Polish pianist Krystian Zimerman, himself also winner of the famous Chopin competition, has recorded the concertos twice. Once with the LA Philharmonic under Giulini in the late 1980s. Knowing that Zimerman is one of the most perfectionist pianists out there, if he records something twice, you can be sure, he does it for a reason. This second recording from 1999 with a hand-picked “Polish Festival Orchestra”, and while the Giulini recording is already excellent, this one really is a true benchmark. Zimerman (also one of my Top 10 Favorite Classical pianists) is also my recording of choice for the Ballades. I’ve had the pleasure of hearing Zimerman perform some of these live, including the beautiful Barcarolle that you’ll also find on this outstanding 1988 album. Don’t miss it. A Chopin list without Maurizio Pollini wouldn’t be complete. I could have easily mentioned him for the Preludes, and several of his other Chopin recordings are legendary. He, like Blechacz, Zimerman above and Argerich below, is also a winner of the Warsaw piano competition (Not that this competition is held only every 5 years, winning it is truly a big deal). The Etudes are technically extremely challenging. Apparently even a true master like Pollini needed cuts in recording (hundreds of them if you believe some reports). In spite of this piecemeal type recording, the result is just fantastic, and can be described with only one word: fantastic. Perahia would have been a nice alternative, but Pollini really remains the reference. Marta Argerich won the Chopin Competion 5 years after Pollini. This was one of her first recordings. You will never hear Chopin’s sonata no. 3 played more passionately. Argerich (another member of my Top 10 Favorite Classical Pianists) is in a way the complete opposite of Pollini. Pollini is typically the perfectionist, rational architect, and Argerich is known for her energy and fire. Check out her recording of the piano concertos for another example of her extraordinary talent. Chopin really isn’t well known for his chamber music. So I must admit that until recently I only knew one recording of this, by Sol Gabetta. In preparation of this blog post I checked out several versions, and end up again with the great Martha Argerich, joined here by the cello giant, Mstislav Rostropovich. No Chopin list can be complete without the name that is most closely associated with this composer: Artur Rubinstein. Yes, it truly is a historic pre-war recording, but the playing really makes up for it. I usually didn’t care so much about these little dances, but Rubinstein really gives these little pieces such a very special meaning, it is a pleasure to listen to. I typically don’t recommend box sets. Even the better ones are typically hit and miss, as they are typically just “recycling” of older catalog material. But you probably have noticed the large number of yellow covers above, and DG really did a great job on this 17 CD box. In a way, you could think that for this blog post pretty much all I did was copy this box set. Well, actually no, I got all of these albums individually over many years (and also I’m not getting any incentive from DG here). But I’m truly impressed by the selection that DG did here (having all this in their archives obviously helped). On top, you’ll also get the Mazurkas and Valses well played by Vladimir Ashkenazy, some individual pieces with Anatol Ugorsky, the Scherzos by Pollini again, and the piano sonatas by Lilya Zilberstein and Pollini again. So if you want to kick-off your Chopin journey, this box really is all you need for a start with truly outstanding recordings. Author MusicophilePosted on February 12, 2017 April 2, 2017 Categories ****, Album Review, Baroque, Johann Sebastian Bach, Keyboard music (Baroque), MusicTags Album Review, Bach, Deutsche Grammophon, Johann Sebastian Bach, Rafal BlechaczLeave a comment on Rafal Blechacz Plays Bach – Beautifully! As you know if you’ve read this blog, before, I have absolutely no problem with subjectivity (see also how do I rate?) even if it may be controversial, and so I don’t hesitate putting my opinion out there, even if I may be a minority (e.g. with Staier’s Bach concertos that the whole world but me seems to love). However, things were slightly different with the 2015 Chopin competition. I mean we’re talking about one of the most important, if not the most important piano competition in the world, only held every 5 years! Former winners include legends like Martha Argerich and Maurizio Pollini, and in more recent years Yundi and Rafal Blechacz. Martha, Yundi, and Chopin specialist Nelson Goerner were part of the Jury this year! So I felt rather belittled compared to those giants, and when the recording of the winner, South-Jorea’s Seong-Jin Cho came out on Deutsche Grammophon, and I didn’t really like the recording, I felt it must be me. Maybe these geniuses saw or heard something I don’t. So I didn’t write about it yet on my blog and decided to give the album some more spins before I formally make up my mind. And then I must admit I forgot about it. Just recently, the two classical journals I subscribe to, Gramophone and Classica, came out with their latest issue, and both reviewed it. And guess what, in both cases, the reviewers were significantly underwhelmed (3 out of 5 stars for Classica, and rather negative comments from Gramophone). So at least it wasn’t just me. Don’t get me wrong, this is fine Chopin playing, but compare his preludes to Blechacz, and sorry but we’re talking night and day in my personal opinion. And then you get Sonata No. 2. Compare this to Argerich herself, or Pogorelich, or Rubinstein, again, this is absolutely no match. Not sure what happened, maybe Deutsche Grammophon just released the wrong takes, maybe Cho will develop over time, but so far I really don’t get it. Obviously, you can’t have a new Argerich every year, but still my expectations were higher. It feels like these days there are so many competitions out there for young musicians. One one hand, that is a good thing, increasing their exposure, on the other hand it is hard for the outside to judge the quality of the different competitions. Well, there is one competition that clearly has proven its relevance over time, the Chopin Piano competition in Warsaw. First of all it is only held every five years. Furthermore, it’s been around for nearly a century. Several times, the jury was critical enough not go give a first price. And then, most importantly, are the winners. What is the common ground between Maurizio Pollini, Martha Argerich, Krystian Zimerman, and Yundi Li, beyond the fact that they are all recognized world-class artists today? Well you’ve guessed it. In 2005, after Krystian Zimerman, another Pole won this competition (you probably know that Chopin, in spite of his French name, was Polish by origin), Rafal Blechacz. I have added below a link to a Youtube video from Polish television of the recital of the winner. I suggest you ignore the poor image and sound quality and skip the introduction, and go directly to the music. Amazing isn’t it? I’ve had the pleasure of seeing Blechacz live two years ago, he still looks rather shy and is not your flashy Lang Lang-style virtuoso at first sight. But then he sits down at the piano and you cannot be but amazed but how beautiful he plays. Chopin’s préludes, especially op. 28, are among his most famous works. And in my opinion, they are among the most beautiful pieces for piano ever written. Don’t get me wrong, Beethoven sonatas are amazing, Schubert’s late works are very beautiful, etc. But there is a certain intensity in the Preludes that makes them very special to me. But my favorite these days is Rafal Blechacz recording on Deutsche Grammophon. Particularly beautiful are no. 13 in F sharp minor, and the Raindrops no. 15 is so delicately played it really reminds you of a light summer drizzle. You can find it here (Prestoclassical), both physically and as download. And as promised above, the Polish TV show on the winning recital at the 2005 Warsaw competition.